For many, Pennsylvania (and specifically Lancaster County) is synonymous with the Amish. But PA, of course, is more than just Lancaster. In fact, the state is home to the largest number of individual Amish settlements, with over 50. Read more about those diverse communities in the new Pennsylvania Amish State Guide entry. A lot of folks think of Lancaster as something that was once a very nice place to visit, well it still is to myself anyway. You just have to look past some of the Amish themed shops and a few tacky signs to see it again, but its all there…………………..Please feel free to check out my post today on my blog called “Lebanon on 2 wheels. I dust off my Schwinn Varsity for a spin in the Lebanon Amish country side. With part 2 this Friday. Richard from Pennsylvania. Sorry if anyone had trouble with posting comments the past few hours–had to fix a glitch but should be okay now. Is anyone willing to take a shot at providing a phonetic pronunciation of the word Kishacoquillas? What is it, OldKat? I find if I know what a thing is, I can say it better. If Rexford Montana is the prettiest Amish settlement then Belliville-Big Valley is the most interesting. The yellow, white and black buggies along with the one suspender and two suspender Amish make this a very interesting community. Bill Colman has done a great job of capturing this unique community by photo. If you visit don’t miss Peight’s store or moon pies. If you have trouble pronouncing Kishacoquillas, just say it like us locals do, and shorten it to Kish! but the phonetic explaination preivously given is right on. Yes, we are unique with black, yellow and white topped buggies. Our yellow and black “topper” men wear just one suspender, while the white toppers wear no suspenders. I grew up thinking that all Amish across the country wore just one suspender; now to find out in just the past 5 years, that other Amish groups wear 2. Also agree that Peight’s store is a must, plus many other small stands along the back roads. We are so blessed! Thanks SHOM & Claudia M. I Googled it and saw that it was an Indian word, or actually a name, so was wondering about the pronunciation. I saw the double “l’s” and if it was a Spanish word rather than an Indian word the “q” would become a “k” sound and there would be a definite “Y” sound for the double l’s so it would sound something like Kish-a-co-KEY-as. Didn’t know if Indian words follow any such convention or not, so I was curious. Of course, I know there would be little reason for Spanish name in PA, but did wonder how the native speakers would have pronounced it. Thanks again. Though I think Claudia is giving us the most convenient solution. I think local institutions are even named similarly, I seem to remember a Kish Bank or Kish Valley Bank? Lowell, Bill Coleman is a master of his craft. When I was starting out early days on this blog, he kindly let me use a few of his photos. I’ve always wondered about his relationship with the local community. He’d be an interesting person to talk to. My husband and I visited the Big Valley in May, but first we spent a couple days exploring the area around Chambersburg and Shippensburg ( south central PA ) and were delighted to find Amish around there, too. They are mostly near the towns of Newburg and Newville, a lovely area tucked away in the countryside with lots of beautiful farms and a couple of picturesque covered bridges. And as we drove around, to our pleasure, we stumbled upon quite a few Amish home-based shops where we purchased plants and delicious jams and relishes. But what impressed us most is that all the shop owners and their children seemed exceptionally nice and friendly. Debbie thanks for sharing your experience in Chambersburg and Shippensburg. I’ve never been to these communities but I guess it is hard to travel far in PA without coming across an Amish settlement. Of the places I haven’t been in Pennsylvania I would most like to visit Crawford County, which actually contains 7 separate Amish communities (or at least did a couple years back). I live in southwestern Chester County (Lancaster’s neighbor to the east), and we have some Amish farms in the Parkesburg vicinity, near the border with Lancaster. I don’t know if there are any Gmays entirely within Chester, or if all of “our” Amish belong to Gmays that are centered in Lancaster. 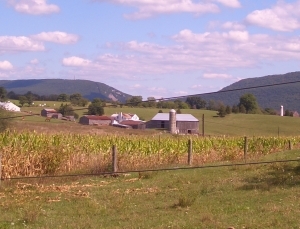 There are still some lovely rural areas in Chester, once you get away from Routes 30 and 202. I suppose a silver lining to the housing slump/recession is that construction of new homes in our area has slowed to a crawl. I heard from someone that lives near lancaster that there are Amish families that rent out rooms….you can stay for a visit on actual amish farm and have breakfast with them…like a B&B….is this true? The lady I spoke to said she met someone that did that…but didnt get the name of farm?? I’ve been doing some geneology and I found some of my ancestors originated from Huntingdon county, so when I looked it up on the map I noticed it is next door to Mifflin county. I now have more reason to visit the area! Though my ancestors there were Jewish instead of Amish. I would like to know where the New Order Amish are located in Pa. Is there a directory? I know most of the New Order adherents are in Holmes County, Ohio, but I haven’t been able to pinpoint the New Order communities in Pa. Thanks!